It’s easy to overlook the huge choice of inexpensive Bordeaux that’s readily available on the market when so much fuss is made about a few dozen grand ‘Cru Classé’ châteaux and the feverish demand and astronomical prices they create on world markets. 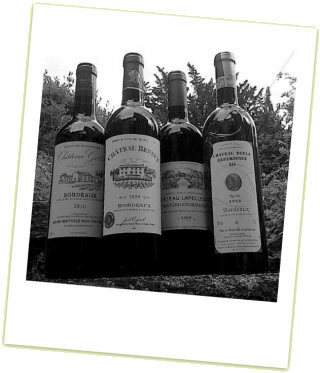 But whilst the ‘petits châteaux’ and branded wines of Bordeaux may offer neither the complexity, ageability or investment potential of the great names of Pauillac, Margaux, St Julien and the rest, there can be some very good and seriously food-friendly drinking provided by wines costing less than £15 per bottle. Here I look at four cases in point: two super-affordable examples at under £7.00, and a red and a white for closer to that £15.00 mark – not everyone’s idea of an everyday price, but far removed from the hype (and some would say madness) of top wines selling for £1,000 and more per bottle. And they are easy to buy with high street distribution and Internet ordering. Of course not all inexpensive Bordeaux is great wine, and there are still many examples that perhaps err too much on the side of leanness and savouriness, presenting a character that verges on the austere. But when that savoury, dry structure also has a bit of fruit and flesh, these are still some of the world’s most enjoyable food wines. Based on the Sauvignon Gris, this has sweet vanilla, a touch of nettle and notes of nuts and seeds leading on to a palate that is still quite fresh and primary. The oak is integrating now, and the fleshy weight and boldness of the pear and peachy fruit does enough to match it. 88/100. £13.49, Averys. From the 2009 vintage this comes from a gravel terroir and blends 47% Cabernet Sauvignon with 40% Merlot and 13% Cabernet Franc. The nose is similarly understated, with perhaps a slightly cooler, more earthy and gravelly set of edgy aromas. On the palate it is another unoaked style where the lean and sinewy edges of the fruit and terroir are to the fore. A food wine, but it is juicy, fresh and enjoyable. 85/100. £6.25, The Wine Society. This 2010 blend is mostly Merlot, and is unoaked. It has a restrained nose of plum with a little hint of a cherry edge. On the palate it is dry, savoury and classic ‘luncheon claret’; it is on the lean, perhaps even austere side and needs food, but it has elegance and medium-bodied refinement with a hint of graphite that is very Bordeaux. Not one for the lovers of big, oaky New World style, but lovely in its modest way. 85/100. £6.49, Marks & Spencer. This 12-hectare estate has been in family hands since the 1930s and the wine is 70% Merlot with the balance Cabernet Sauvignon, aged in new oak barriques. It has a creamy and cedary nose, with some spices and a touch of graphite. On the palate it is more substantial than the less expensive reds, the grip of tannins and the rounding background smokiness of the oak adding texture and flavour, though this is another classically dry and savoury style without any excess fat on its bones. 87/100. £13.79, Tesco. wine-searcher.